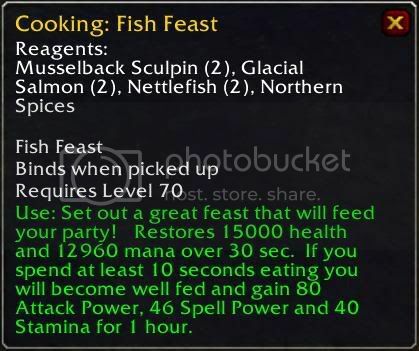 These fishes can be fished in Wintergrasp. These are sold from cooking vendors in Dalaran(Ali-Derek Odds Horde-Misensi) or are looted from Small Spice Bag. Use: Set out a great feast that will feed your party! Restores 13781 health and (0 / 5 * 30) mana over 30 sec. If you spend at least 10 seconds eating you will become well fed and gain 9 Attack Power, 13 Spell Power and 9 Stamina for 1 hour.